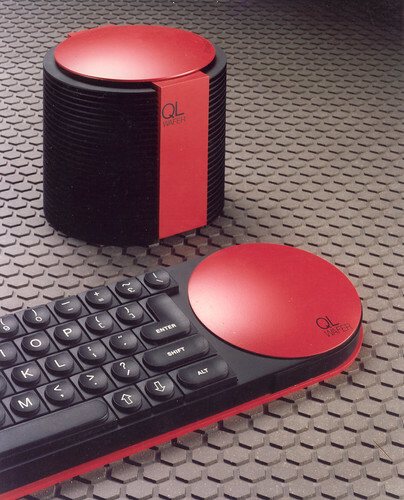 This is one of several Sinclair QL Box-Sets released during 2014, to mark the 30th anniversary of the Sinclair QL Home Computer. This is the Sinclair QL Games Box-Set 3. NOTE: 256K RAM is required as a minimum. The Open Golf requires 640K. Double Block is a clone of the classic Russian game, Tetris. You have various shaped blocks falling down which you can rotate and move left or right to fill the playing grid. Each full line that you manage to fill with blocks then disappears. This ends up being a race against time, as the blocks fall more quickly and once the blocks reach the top of the grid your game is over. Double Block supports a two player mode, as well as an enhanced block mode, with more complicated patterns of blocks. E.V.A. 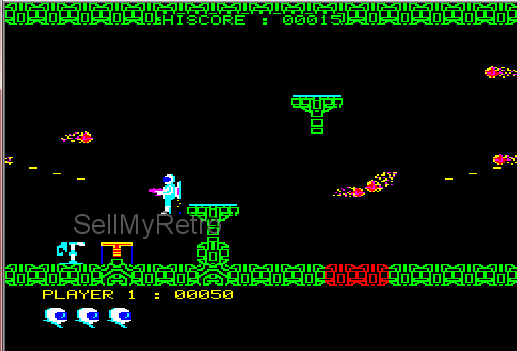 is a game reminiscent of Jet Pac on the Sinclair ZX Spectrum. You play the role of Herdener Greech, lowly astro repairman, and have to repair a Space station which is constantly under attack. To do this, collect various pieces of equipment as the parts appear at the top of the screen (whilst avoiding or blasting the pesky aliens). Jungle Eddi is a platform game in the great retro tradition, whereby you jump across chasms, or between tree branches, avoiding the dangerous insects and snakes, whilst killing them and jumping for prizes to earn points. You have to travel through the jungle and find a hidden door to pass through to the next level - there are five levels and twenty screens in each level, adn the obstacle layouts are randomly generated with each game. Arcanoid is a classic arcade game based on the original Breakout. You have to work your way through 32 levels, by deflecting an energy bolt into the void in order to knock out the bulding blocks of the universe and reach and destroy the Dimension Changer in order to reverse time and ressurect the Arcanoid mothership. Different blocks hide capsule which can help you - for example by slowing down the energy bolt, or expanding your craft, or disrupting the bolt into 3 separate components. The Open Golf is based on the standard computerised golf games which you saw prevalent in the 1980s. You play a series of 18 hole golf courses, and are presented with an overhead view of the golf course, along with details of wind speed and direction, and location of your ball. You then have to control your direction, strength behind the shot and type of golf club used to strike your ball and try to beat the course record. Baron Rouge is a fast shoot-em up game, where you play the part of the Red Baron from World War I (Manfred Albrecht Freiherr von Richthofen) in his battle against enemy fighters. However, you are not sure if you are in a dream or some sort of parallel universe, as the enemies turn into hang-gliders, fish on skateboards and even winged horses, as well as the usual planes and airships. (The gallery shows all of the box sets which have been released so far).